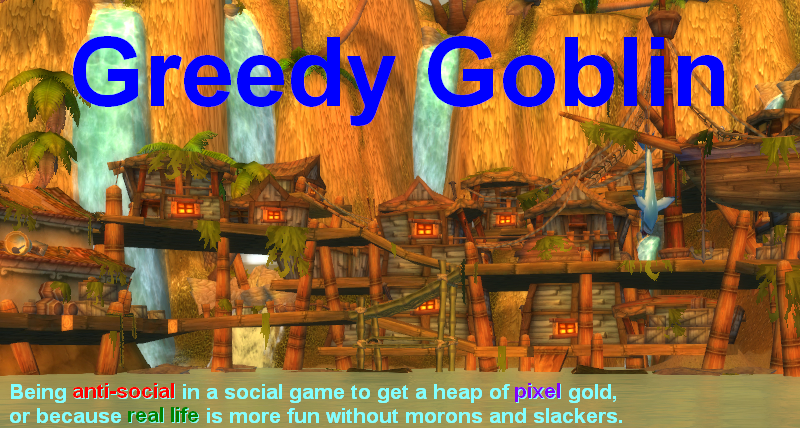 You can be assured of the title if you check posts on the Goon propaganda site and comments left by the minions of Evil anywhere. 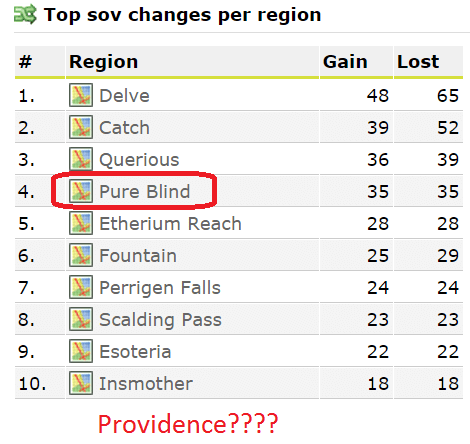 On the other hand if you check the August Sov change stats on Dotlan, you can find this: Yep, Providence isn't even in top 10. Pure Blind, where everything is under control and MoA is hellcamped into their NPC station on the other hand is #4 in sov changes. Oh, I almost forgot, CO2 and TNT already deployed home because of certain timers in Tribute. Finally, my favorite: check the Providence map! EXE, SMA, Bastion captured a few systems. What about CONDI? Zero. I checked their Sov change log and found zero entries on Providence and a few pages of Pure Blind. Way to go Goonies, if you keep up this performance, you'll be losing supers at the undock of your home station to Harry Forever! Oh wait! Talking about the titan owner, - according to the propaganda - he just laughed on that "fun PvP content" and was totally chill about it and it's already replaced. Selling the pilot is just a troll to make us believe that he is cashing out to ragequit EVE. And when we all believe it, he'll just laugh and pull his replacement titan and keep on dropping on MoA, like he did the days before and like he tried on his last day. Finally: despite MoA guys forgot the "Gevlon Goblin send his regards" spam while they were busy tackling the titan, I convinced Chribba to release the 20B of the titan bounty, so the corp Killing Intent received it, since their pilot was the #1 damage on the titan kill report. I hope they share it with other pilots who lost their dreads on that glorious day. PS: MoA and OOS joined forces again to fight an SMA fleet of nearly equal pilots. What an adrenaline-pumping battle, I wish I was there! These two were more conventional, but of course provided the same outcome. PS2: this is why you shouldn't smuggle contraband. Or anything with the mark of Evil on your ship. Provi got every ihub destroyed in the region and stations freeported. Sov changes reflect tcu. Well, http://evemaps.dotlan.net/map/Providence#structures says lot of "I" (did they already rebuilt them?) and Providence stations were always free to dock to any neutrals, so I'm a bit confused. Wait, wasn't your 20B bounty for awoxing a titan? I'm pretty sure that was your original description. Someone IN the imperium had to be the ones betraying it's location / lighting the cyno or the likes. After all, your claim was that for 20B betrayal would be guaranteed. You've admitted then that you were wrong about that claim? First poster was smoking. They only got half the I-hubs.. which is half the number they wanted to get. No, Awoxing was encouraged, but not demanded. I indeed accept that the bounty didn't work (it was out for a year with no effect). It was paid now for no other purpose than let OOS replace their lost dreads. The target was, indeed, IHubs and IHubs only. .EXE just blitzed through their constellation though and had it nicely set on fire in the predicted 3 day time limit (they even went for a TCU reinforce on the first day). They went for a bonus round later and dropped 2 TCUs, probably for kicks. As others said, an extremely small number of TCUs were targeted by Goon forces and only a couple out of those were replaced with goonie ones. To answer the questions about IHubs, they can be replaced immediately after destruction. While they monetary issue can be important (They tend to cost around 2b for "Ok" upgrades, more for "perfect") the biggest factor in destroying them is that it resets the Strategic Index of the system and said index cannot be artificially boosted. While it's hard to measure, the effect of not having Jump Bridges for 35 days surely has an large economic cost attached to it. While some systems indeed have zero strategic index, most have 4 or 5, showing no IHUB loss. There's actually a discrepancy between the in-game display and dotlan in quite a few cases wrt strat index, for whatever reason. Unfortunately dotlan doesn't accurately show the strategic index anymore. Take for example http://evemaps.dotlan.net/system/DP-JD4 . On dotlan it shows as having a strategic index of 5, but in-game you'll see it's actually 0. The same is true for a couple of other systems. I guess the API isn't returning the correct results with the new "fozzie"-sov. Around 50% of the I-HUBS got destroyed, some of the holders expected to be chanceless and choose to don't give the CFC a fight. The structures in these systems went down with nearly now resistens. Others choose to fight back, and against the common opinion that the CFC will dominate this invasion, these holders did a pretty good job and saved all or nearly all of their structures. Props to the CFC for not dropping supers. Goons had some success where they could concentrate their largest blobs, but failed in smaller engagements as expected. CO2 did particularly bad, failing to achieve any objectives in their assigned AO despite outnumbering the local defense fleet (90 T3Ds and inties to less than 20 HACs). Surely the goons inflicted quite some damage, but they also lost a lot more in ships despite having an overwhelming numerical and isk advantage (third parties can help the attacker more than the defender under fozziesov). Jump bridge losses are annoying, but hardly the end of the world, since Phoebe already curtailed their usefulness to a great degree. Overall it was fun. No seriously, a lot of fights and a lot of first hand experience at what works under Aegis Sov and what doesn't. I'd even give goons props for bringing us content if they weren't so obnoxious in local. Also, my two cents on balance: trollceptors are a thing and still need to die in a fire. They are killable, don't get me wrong, but they are just so boring to kill for a measly 50m killmail. Entosis should be restricted to battlecruisers or cruisers sacrificing some fitting space. Or at the very least be disallowed on nullified ships. Ihubs don't go on the stats, and they were the main target in providence. This is why more than basic stats are needed. Pure blind had so many changes because it moved from TnT to goons. We all know this. Why try to pretend otherwise unless you're back to trying bad propaganda again? About the Pure Blind sov changes. In large part, that was the sov transfer between TnT and Goons. CCP didn't put in a way to easily transfer sov between alliances, so they wound up having to kill TnT's infrastructure to put up the Goon's. On the other hand, MoA did take advantage of the turmoil plus the deployment to Provi to do as much damage as possible, so good job there. @Noizy: and then from Goons to SMA. I agree that most changes had no MoA tag on it, however I see no reason between the back-and-forth than MoA. The Imperium consolidated their holdings and "properly" assigned its to their members before Aegis. TNT lost their holdings in Deklein but not in PB, so they were not meant to be lost. Then MoA started to reinforce systems and TNT couldn't defend them. So Goons took all (except those snatched by MoA). But they had trouble defending them too, due to large distance from home, so they gave the closest constellation to Fade to SMA.